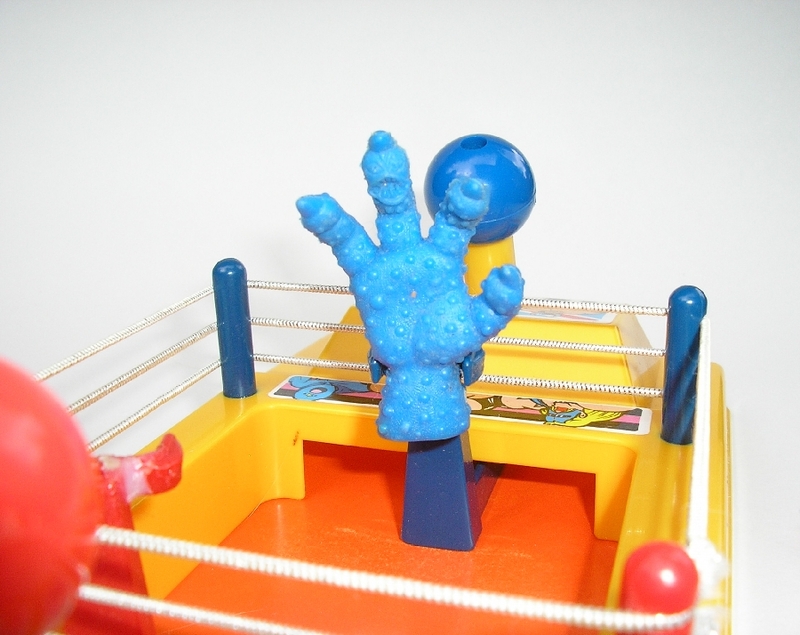 A wrestling ring accessory makes the most sense for a group of wrestling figures. Mattel also recognized they could use some existing parts from Bandai’s release of previous versions of the ring. 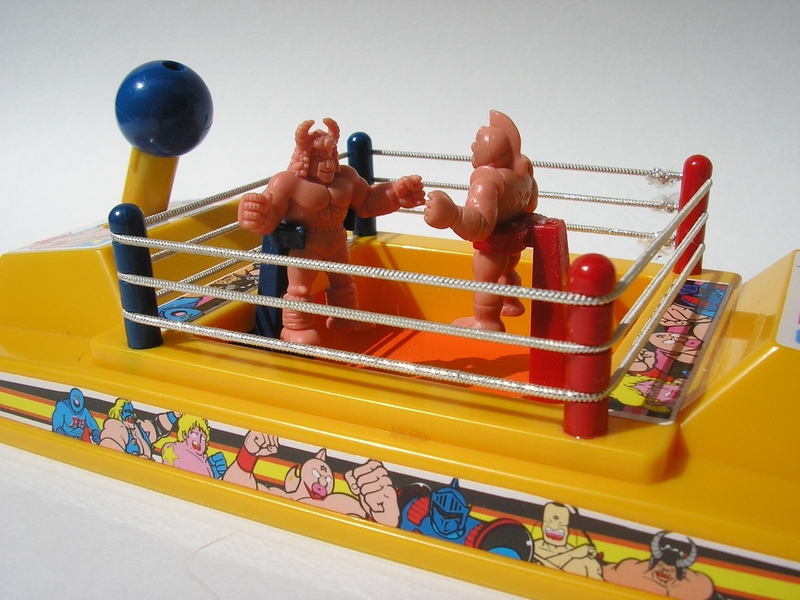 In 2005 Mr. Smith first discovered Bandai’s similar product, the Battle Game, which was showcased on Naochin’s Kinnikuman website. 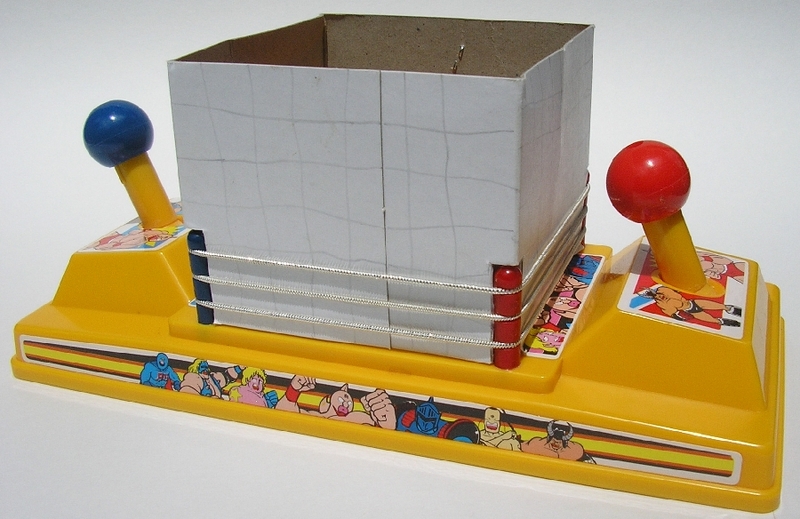 The majority of the Battle Game looks similar to the Mattel set. Most noticeably different is the rock-like enclosure, different art (including the paper arch above the ring), and figure clamps. 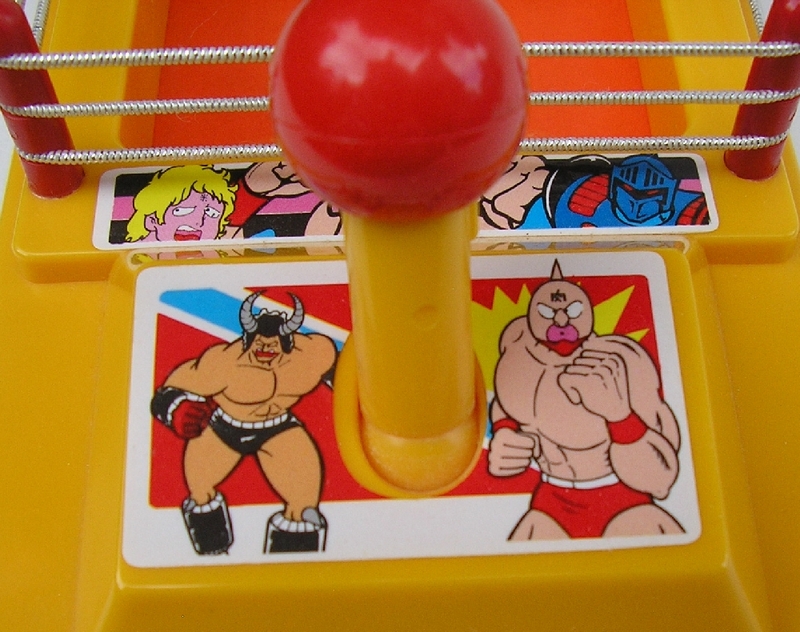 Matthew also discovered another version on Bandai’s ring on Naochin’s site, called the Pro Wrestling Game. This version looks much closer to the Mattel version. The most noticeable differences here are the extended controllers and bizarre figure clamps. Based on Mattel’s box art it appeared that they were considering making an important upgrade on the figure clamp. The box art shows a seemingly metallic clasp. This clamp would have seemingly been more resilant to the constant pressure of inserting figures and figures breaking loose from play. Unfortunately Mattel decided to use a brittle plastic on the figure clamps and this toy was easily broken. 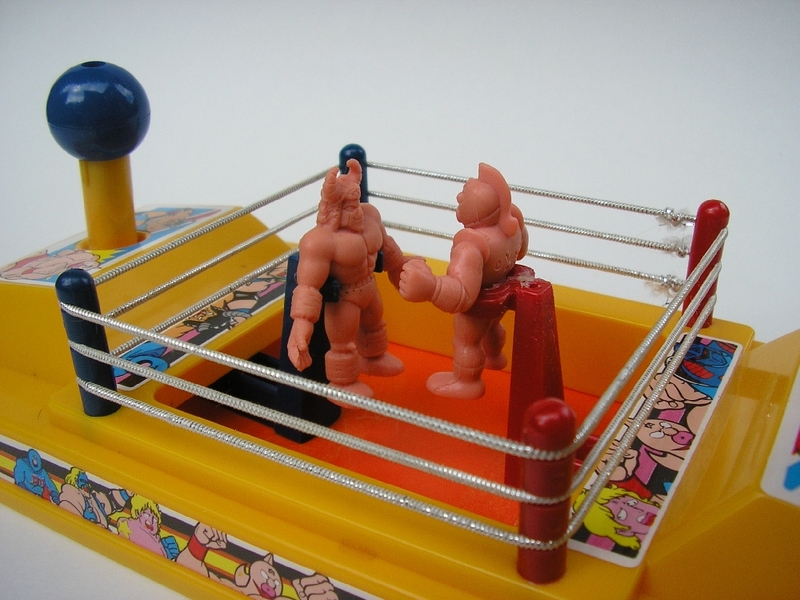 It seems that Mattel recognized that the unique designs of these figures would be an important draw for children, as seen on the Pre-Pack. 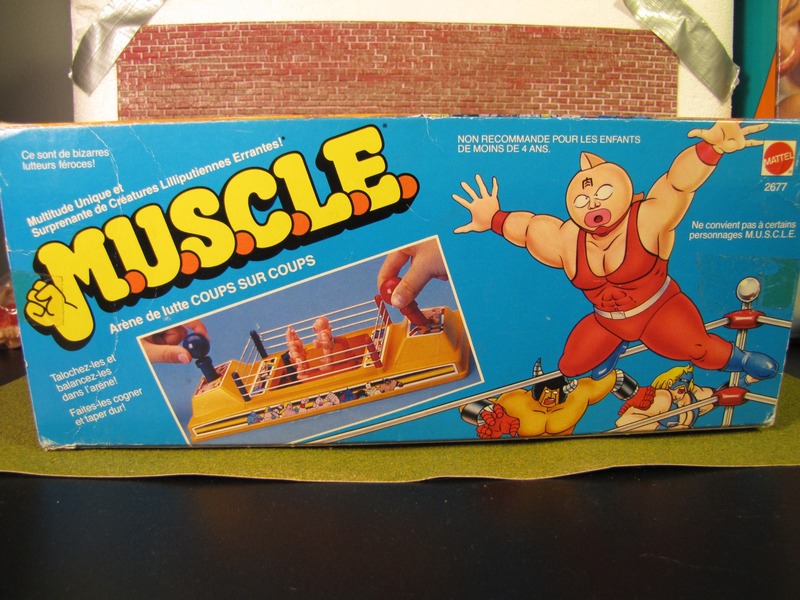 It is curious that the main accessory for the line of M.U.S.C.L.E. figures did not accommodate many of the most interesting sculpts. An upgrade to the figure clasp could have possibly accomaded many of these sculpts. The figure clasp was not the only inconsistency on the box art. 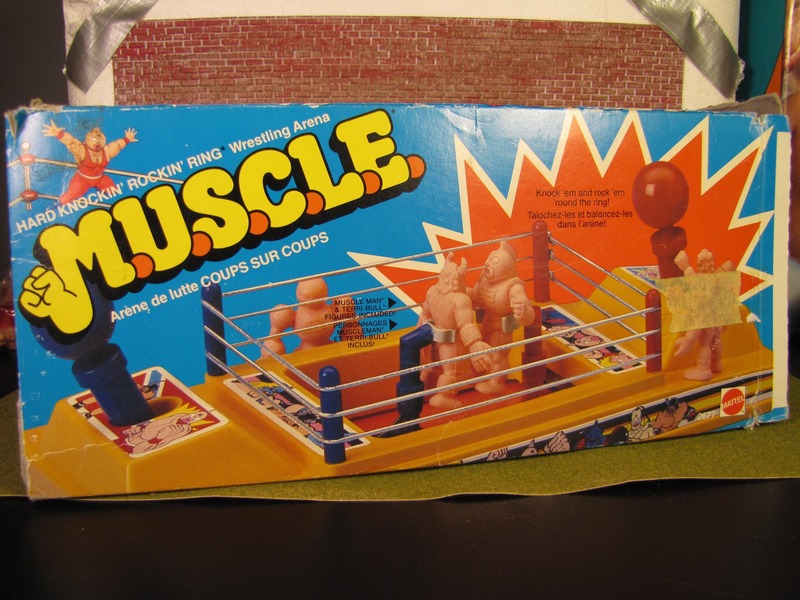 The set included two figures: a Muscleman and a Terri-bull. 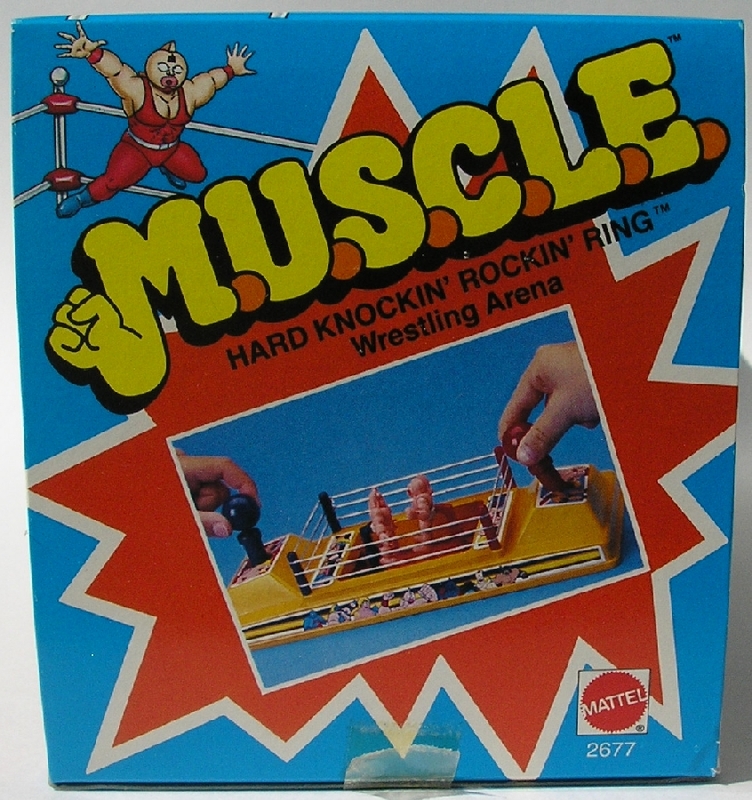 The box makes no mention of the figures being exclusive to the wrestling ring product. 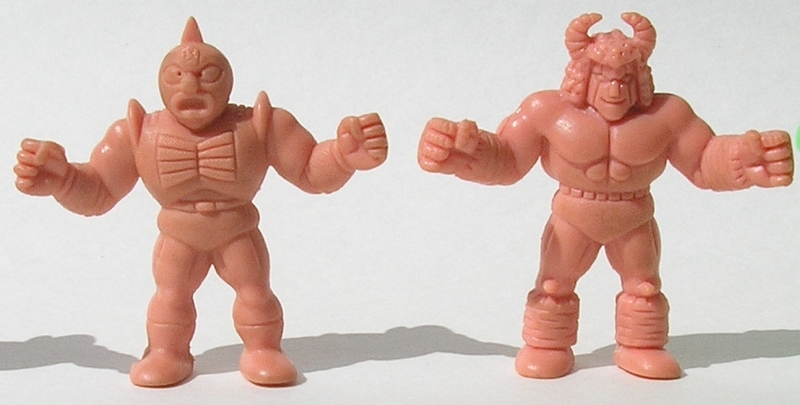 Regardless of this oversight, the wrestling ring came with two somewhat exclusive figures. There was a completely new Terri-Bull sculpt, which was not featured on the poster. However, this figure was also featured with the board game and cast in the color green. 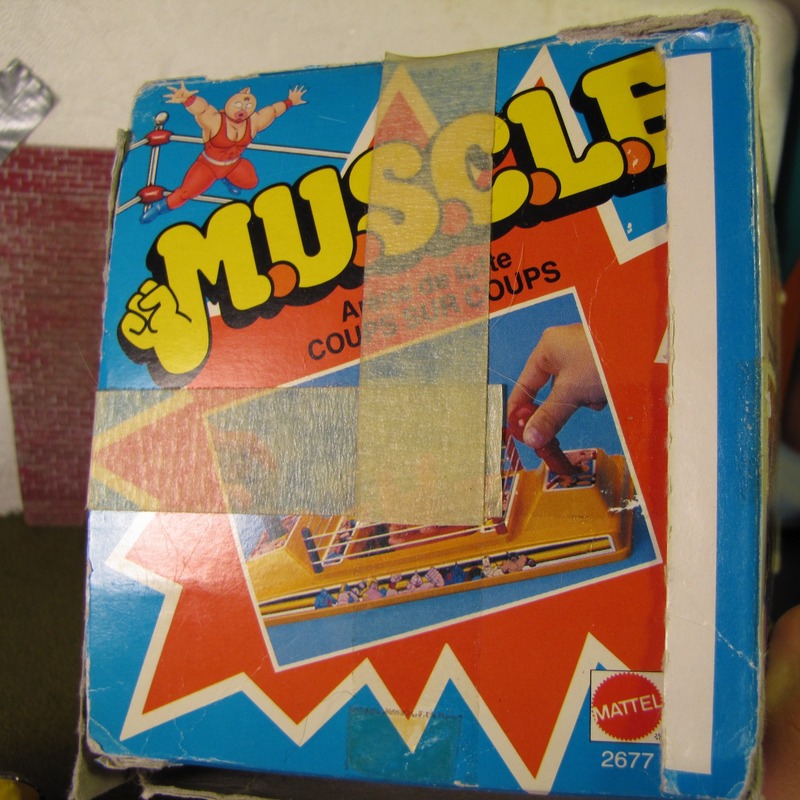 There was also an odd Muscleman. 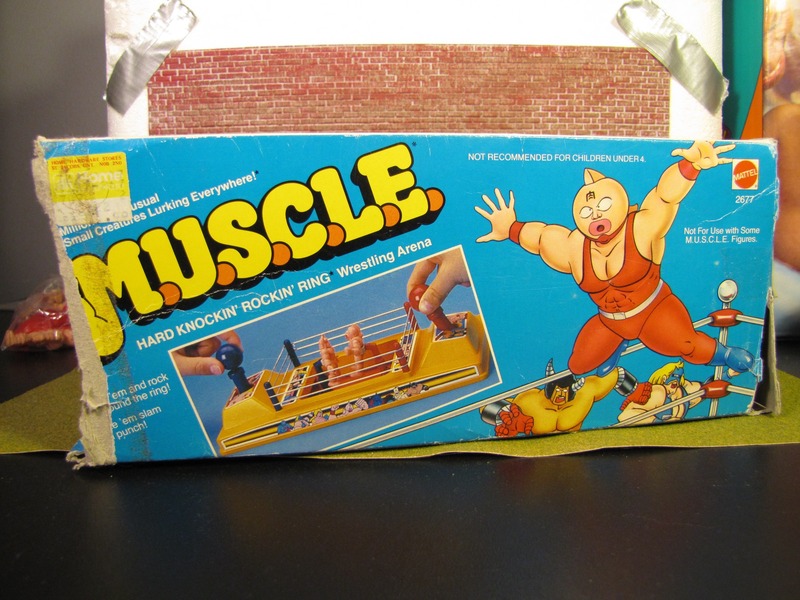 At first glance the Muscleman figure simply looks like figure #141. 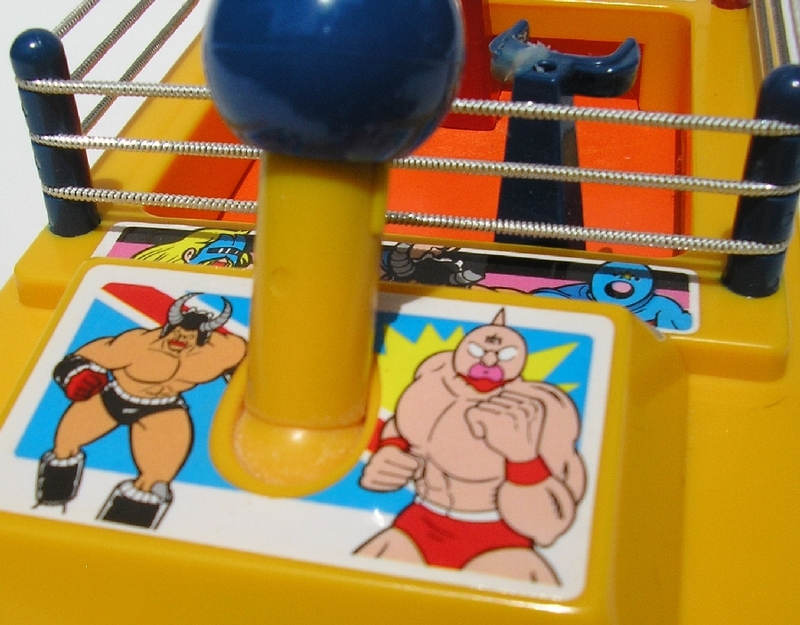 The reality of the Muscleman situation is much harder to decipher. There are two likely scenarios: (1) a new sculpt; or (2) a copy of #141. The new sculpt seems unlikely as the cost benefit to Mattel to create a “new” version of figure #141 is not clear. 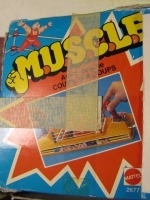 The copy would likely be the result of Mattel using an existing figure to simply create a new mold. This would explain the smaller size. 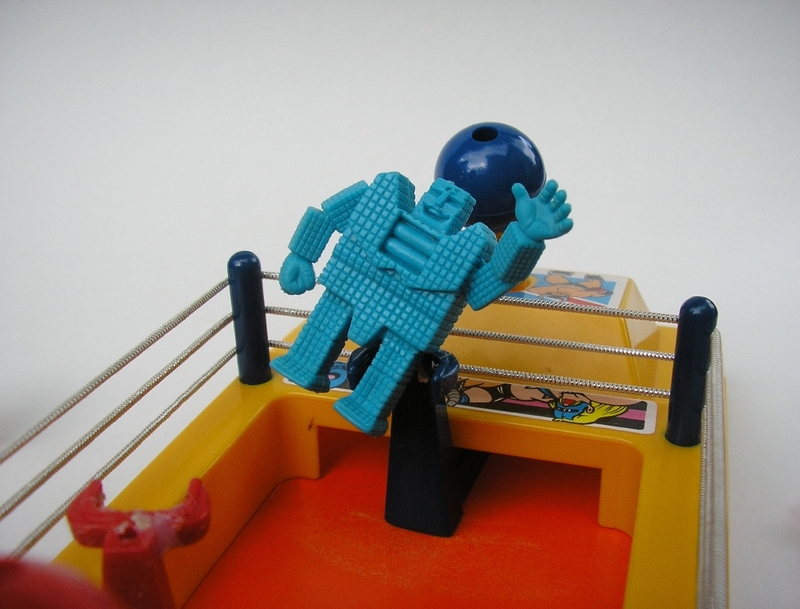 Some people object to this theory because the belt buckle appears to be different in on the wrestling ring figure. The buckle appears to be more rectangular. It is the belt buckle that most people use to trumpet the figure as being a new sculpt. While it is possible, the rest of the figure looks nearly identical. 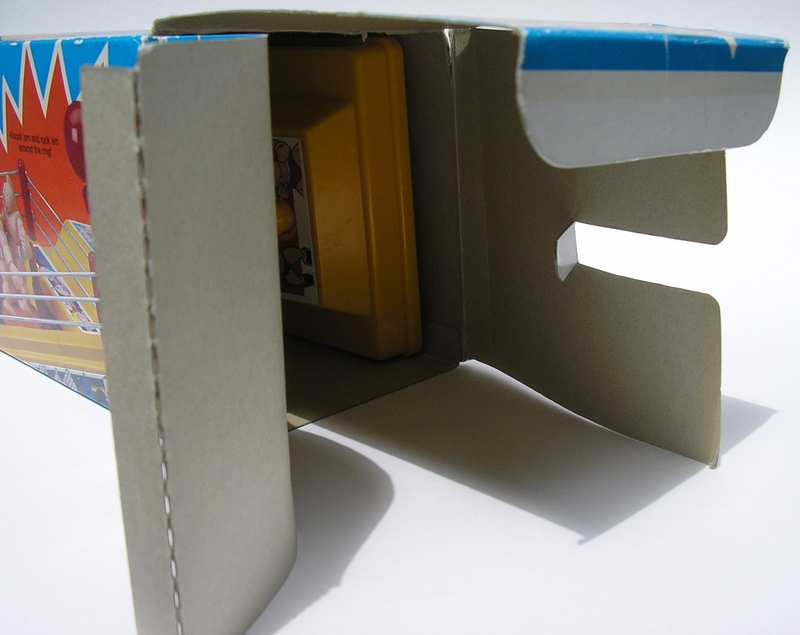 It is unlikely that a perfect recreation hardcopy was produced and made smaller with the only difference being the belt buckle. It is the position of the University of M.U.S.C.L.E. that the figure is simply a copy. The more rectangular buckle is the result of a mold cavity variation, not a variation in the sculpting or hardcopy. The circular buckle was accidentally stretched and became more oval – or rectangular. As this difference was so minor, it probably passed any quality inspection or no one cared. It is interesting to note that based on the box, this product was made in Japan. This further supports the likelihood that the figure is simply an iregualirty in the mold, instead of a new sculpt. With Bandai already having the sculpt, there would have been no need to create a new figure. 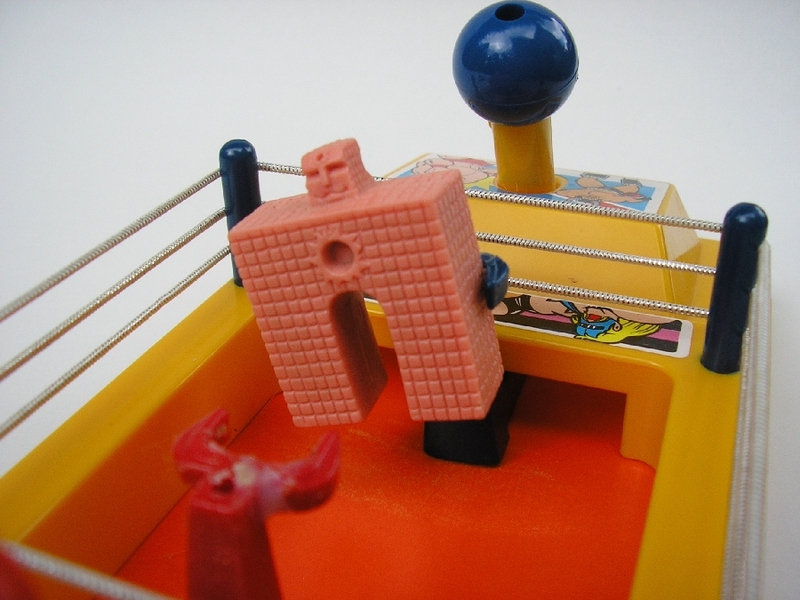 Bandai may have needed to make a copy of the mold to allow another factory to run the Hard Knockin’ Rockin’ Ring Wrestling Arena. 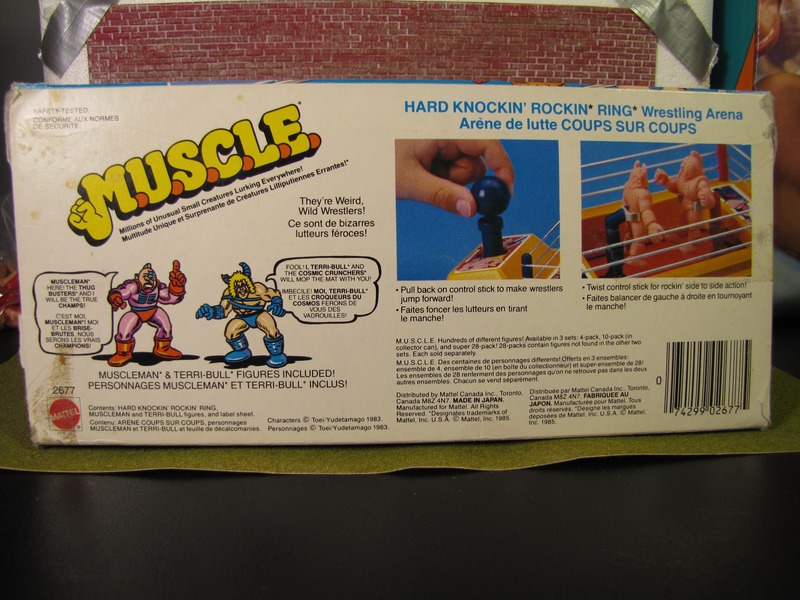 In September of 2015 Auction Watch #168 highlighted what was possibly the first documented French-Canadian version of the Hard Knockin’ Rockin’ Ring Wrestling Arena. The pictures below offer a full view of the French-Canadian version. 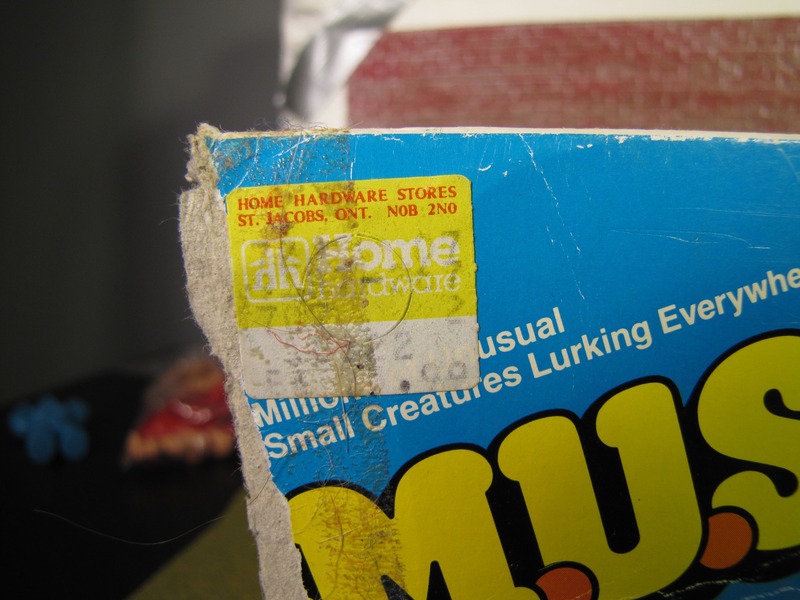 The box is very similar to the English version, but the price tag is interesting, This particular price tag (even if it is covered in years of gross hair, fuzz, and dirt) is from Home Hardware. Having an easily identifiable Canadian company adds mountains of charm. Even more interesting is that the city and zip code are given for the store. 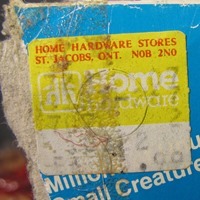 If so inclined it would be possible to visit the Home Hardware where this box originated. This entry was posted on Friday, August 7th, 2009 and is filed under History, UofM News. You can follow any responses to this entry through RSS 2.0. You can skip to the end and leave a response. Pinging is currently not allowed. Auction Watch #43 « University of M.U.S.C.L.E.